your heart and support overall health. In fact, good fats—such as omega-3 fats—are essential to physical and emotional health.A walk down the grocery aisle will confirm our obsession with low-fat foods. We’re bombarded with supposedly guilt-free options: baked potato chips, fat-free ice cream, low-fat candies, cookies, and cakes. But while our low-fat options have exploded, so have obesity rates. Clearly, low-fat foods and diets haven’t delivered on their trim, healthy promises. Despite what you may have been told, fat isn’t always the bad guy in the waistline wars. 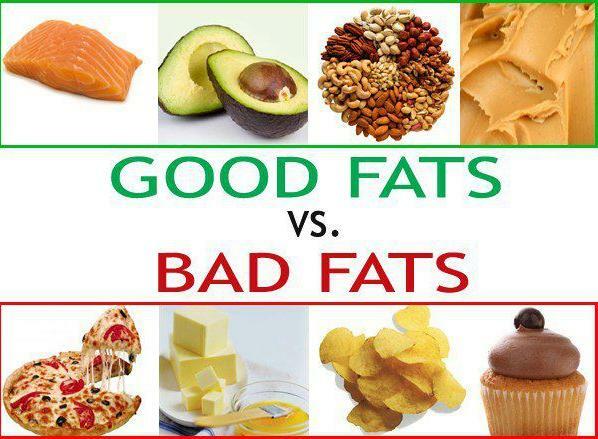 Bad fats, such as saturated fats and trans fats, are guilty of the unhealthy things all fats have been blamed for—weight gain, clogged arteries, and so forth. But good fats such as the monounsaturated fats, polyunsaturated fats, and omega-3s have the opposite effect.As a matter of fact, healthy fats play a huge role in helping you manage your moods, stay on top of your mental game, fight fatigue, and even control your weight. Saturated fats and trans fats are known as the “bad fats” because they increase your risk of disease and elevate cholesterol. Go for lean cuts of meat, and stick to white meat, which has less saturated fat. Bake, broil, or grill instead of frying. Remove the skin from chicken and trim as much fat off of meat as possible before cooking. Avoid breaded meats and vegetables and deep-fried foods. Choose low-fat milk and lower-fat cheeses like mozzarella whenever possible; enjoy full-fat dairy in moderation. Use liquid vegetable oils such as olive oil or canola oil instead of lard, shortening, or butter. Avoid cream and cheese sauces, or have them served on the side.